I’ve been on a roll making nature art this winter. I can’t walk anywhere without seeing potential. Mother nature’s palette is abundant, always transforming. Leafs change color, flowers bloom, rocks brighten with rain drops, branches fall. There is no lack in the material available. I was almost late to work the other day because I stopped at the park and began making a wreath with some beautiful, bushy, bright yellow flowers that had fallen off of a tree. Of course I had to arrange them. I couldn’t just walk on by. Luckily when I pulled out my phone to take a photo of my art, I saw the time and rushed off to work, arriving just a minute late. I hope you enjoy these pieces as much as I do. If you want to buy an 8×10 print for $35 or a high resolution digital print for $15, send me a message with the Contact Us page. Autumn in southern California isn’t like the majority of North America. We have less obvious changes. 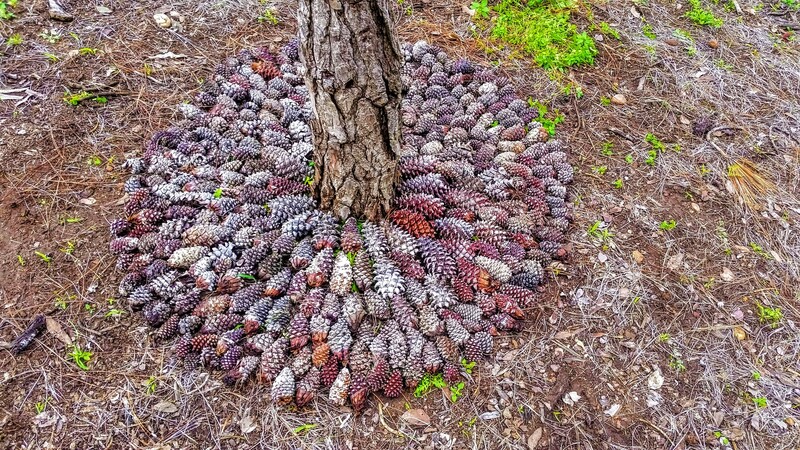 Despite popular belief, some plants and trees do hibernate, but not all at once and not all have such colorful transformations. Plus, as a semi-tropical climate, we often have our hottest days in October. So, having a hot pumpkin spice latte while hiking through the mountains is less appealing. Spending last autumn in the Northeast of Massachusetts, Connecticut, and Maryland reminded me of how autumn can be so strikingly beautiful and so cold, in different latitudes. I really enjoyed the large expanse of hills changing colors into oranges, reds and yellows. It was a feast for my eyes. While working in Wareham, Massachusetts, I created this autumn bouquet on the banks of a river by an old red barn. This art is part of my adventure of traveling for eight months in a row. You can read more about my travels and how I could afford to be gone that long on a starving artist salary here. It is the print and postcard of the month that I mailed to patrons of my work on Patreon.com/Loviedo. 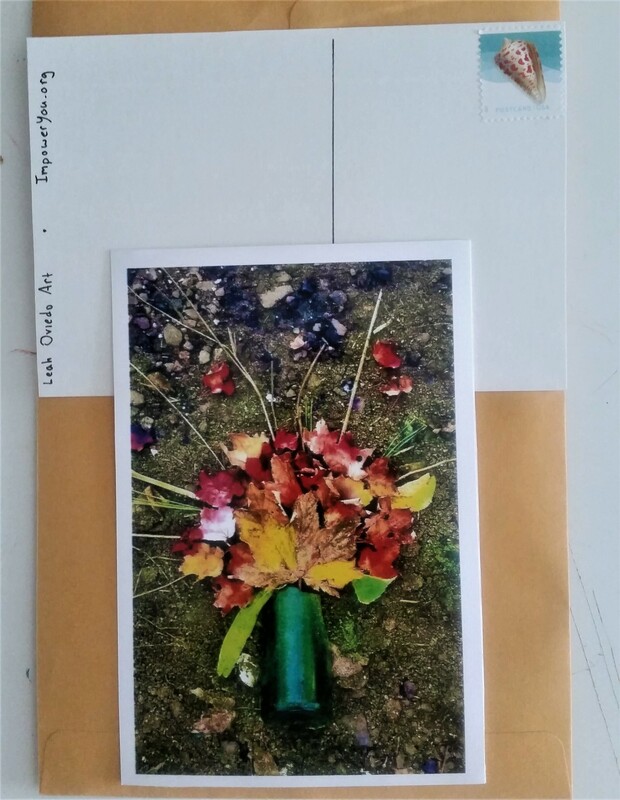 If you are in the USA and would like to receive art in the mail each month, join me there! I also write poetry. 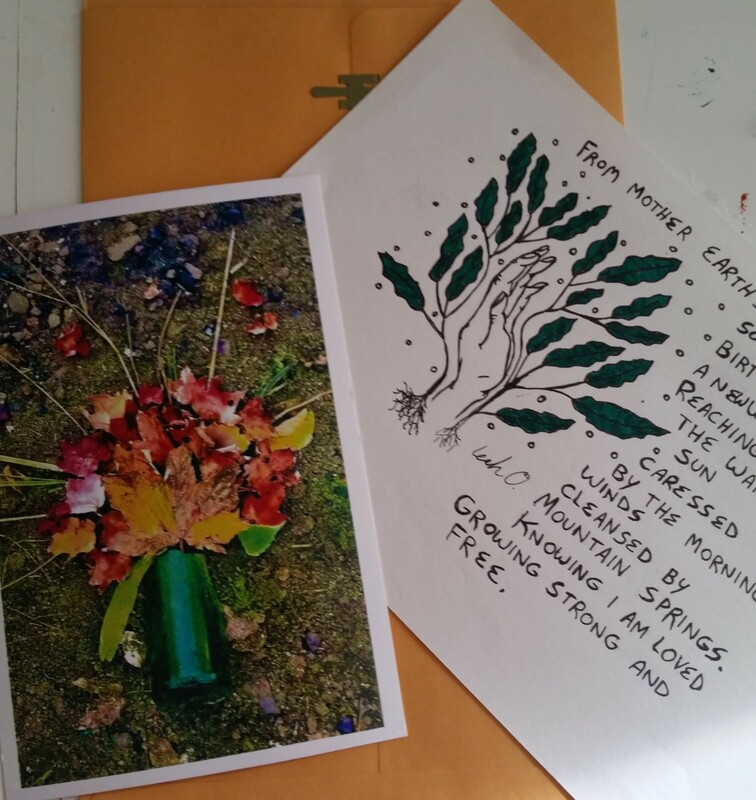 As you can see one of my patrons has signed up to receive an art postcard and an illustrated poem in their mail each month. I offer many options and budgets for patrons to choose so I definitely recommend checking it out. I’m an artist and writer with a focus on art therapy. If you would like to support my heart work, please consider becoming a monthly patron on Patreon.com/Loviedo. For $1 a month, you can fund programs like my D.I.Y. Therapy: Healing Depression E-course, my monthly “Radical” e-zine and other creative healing projects, like “Cultivating Radical Self-Love: A Collaboration of Healers, Artists & Writers“. Blue has always been one of my favorite colors. I couldn’t resist photographing these random canyon spray paint jobs. One was on an old tree trunk and the other the metal cover of the sewer system. I don’t know who painted them or why, but they sure are beautiful. Order an 8×10 matted print for $28 (US) by sending a message though my contact page. 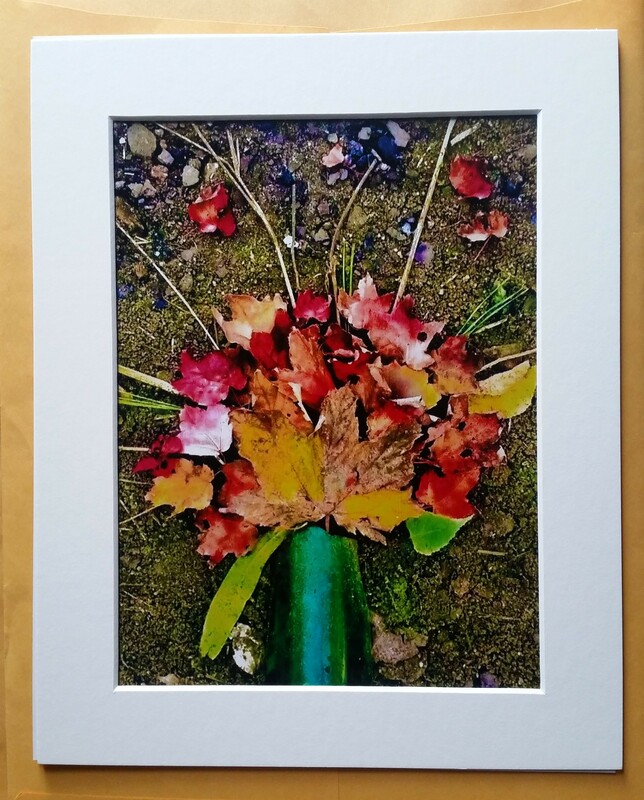 *Order an 8×10 matted print for $28 (US) by sending a message though my contact page. I love to use repurposed materials in my art. Zero-waste or as close to possible is my goal! I love to paint, but much prefer to salvage in my neighborhood for material and inspiration. If you make zero-waste or eco-friendly art, please comment below. If it fits with my theme, I will feature you here on my blog. Summer is blooming with vibrant colors; vines travel up tree trunks, flowers burst with nectar and the sun shines brighter than usual. Let’s celebrate the summer with gifts from mother nature. What better way than to make a little magic with the plants that are overflowing in our backyards, forests, valleys and canyons. You can receive postcards or prints of this piece by becoming a patron of my work on Patreon.com/Loviedo. I made his heart with seaweed on a beautiful sunny day at the beach. It’s one of my favorite pieces, even though I’m not usually a fan of heart designs. I love creating art outside because it is a calming experience, akin to meditation for me. It is also non-toxic, doesn’t create waste and the supplies are free so everyone can make art.